An infamous accident black spot is set to change shape as part of a £90,000 improvement scheme. Work on the A280 Long Furlong road, between Findon and Clapham, will begin on April 23 as part of safety improvement works carried out by West Sussex County Council. The project will include altering the shape of two of the most severe bends, near the pumping station and near Findon Cricket Club’s field, adding a higher-friction road surface and replacing cats eyes. There will also be patching work ‘to reduce the likelihood of future potholes and in preparation for more extensive resurfacing in 2019/20’, a county council spokesman said. The scheme is set to take two weeks to complete, subject to factors like extreme weather, and the spokesman warned that there will be delays during this period as temporary traffic lights are put up. 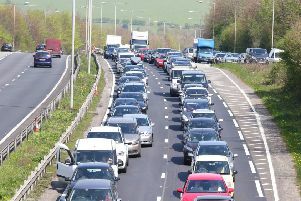 The work is scheduled to take place ‘outside peak hours in an attempt to reduce its impact on traffic’ the spokesman said. The road will be closed 9.30am to 4pm, with a signed diversion route via the A27 to Worthing and the A24 to Findon. During peak periods and evenings, two-way traffic lights will be used for the safety of road users and the workforce. Local access to homes and businesses will be maintained.